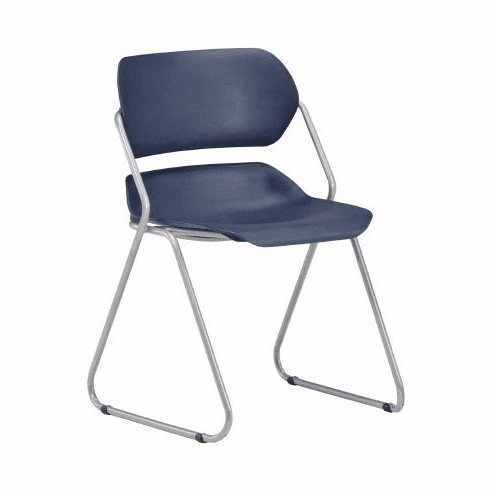 This contemporary stacking chair features a durable plastic seat shell available in your choice of three different colors. Other features include 16 gauge steel tube frame with sled base, your choice of black or silver frame finish and ships fully assembled for immediate set-up. Meets or exceeds ANSI/BIFMA safety standards. These chairs must be ordered in quantities of four. Ships by common carrier due to assembled size and combined weight. Dimensions: Seat Size: 18"W x 19"D. Back Size: 18.5"W x 8.5"H. Seat Height Adjustment: 17"H. Overall: 31"H x 20"W x 20"D. Limited lifetime warranty from OFM. This chair normally ships within 1-2 business days from our NC warehouse. Price listed here is for (1) stacking chair.